Brookings – MOES Briefing Papers out! Include your name, phone number and group affiliation, if any. Bill Grant – Deputy Commissioner of Energy? THIS DOES NOT BODE WELL FOR TRANSMISSION PERMITTING! The Minnesota PUC meeting for the CapX 2020 Brookings – Hampton oral argument has been scheduled for February 3, 2011, beginning at 9:30 a.m. Deadline to register is Tuesday, February 1, 2011 @ 9:30 a.m. The RUS page says that the Comment period was extended, reopened through December 6,2010. ??? I’ve asked Stephanie Strength for a copy of the Notice on this, and am sending in a request for an extension through March 1, 2011. It’s not as if anything is happening, the conslutant hasn’t been hired, everybody’s snoozing… waiting for??? Where is the money for CapX 2020 transmission infrastructure (and other capital costs) coming from? This came up when our house deal was making life complicated, and then I was off in Colorado, so I didn’t get it posted, now it’s time to catch up! Xcel went to the PUC for changes in its Capital Organization wiggle-room, and got what they wanted, with some additional reporting requirements. What I’m noticing is that something like this that ‘s SO important, like the Otter Tail Power “Standstill Agreement,” and like the Otter Tail Power “Standstill Agreement,” there’s enviro silence. Nobody is on this… why? Minnesota utilities are powering up in 2011, submitting capital spending plans and proposals on power projects that will cost nearly $2 billion. Utilities’ spending for 2011 is dominated by wind energy projects and planning the CapX2020 network of transmission lines to carry that power to consumers. Neighbors and conservation groups are strongly opposed to several of the projects involved in these already-approved 2011 spending plans. Minneapolis-based Xcel Energy leads utilities in capital spending after the Minnesota Public Utilities Commission (MPUC) on Thursday unanimously approved Xcel’s plans to spend $1.2 billion in 2011. The regulatory board voted to let Xcel issue a variety of securities to help cover its 2011 capital spending. According to documents filed with the MPUC, Xcel plans to pay for the capital projects with short-term debt and multiyear credit agreements, a $300 million long-term debt issue in the third quarter and $190 million in cash. Today NoCapX 2020 and United Citizens Action Network filed Exceptions to ALJ Richard Luis’ Recommendation/Non-Recommendation filed on December 22, 2010. Does anyone remember the SDEIA study where they noted that there’s no market, and if they wanted to build transmission, well… WHY? And there’s a meeting about that part of the Brookings line TONIGHT!!! The intervention deadline is January 24, 2011. 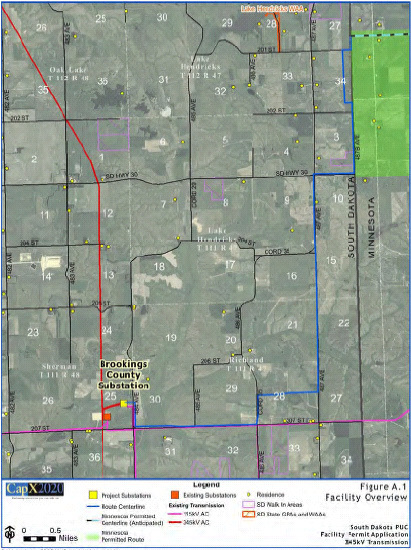 The South Dakota Public Utilities Commission will hold a hearing in Brookings tonight on a transmission line that would move power from wind farms in Brookings County to the Twin Cities. Xcel Energy, representing the CapX2020 initiative – a group of 11 utilities proposing grid upgrades throughout the region – will make the pitch for the 10.6-mile, 345-kilovolt line. The hearing is at 6:30 p.m. at the Swiftel Center, 824 32nd Ave., in Daktronics Banquet Room A. The application can be found on the Wisconsin PSC’s site. CLICK HERE FOR PSC DOCKET PAGE- – SEARCH FOR DOCKET 5-CE-136. And answers to “informal discovery” from PSC Staff, note reliance on 2007 testimony in Minnesota! An application filed Wednesday proposes at least 40 miles of new high-voltage transmission lines that would run through Buffalo and Trempealeau counties, including potential routes through Cochrane, Galesville and Arcadia. A permit application filed by CapX2020 shows three route options for 345-kilovolt lines that would run from Alma to La Crosse, Wis.
A 43-mile route that follows Highway 35 through Cochrane before routing east of the highway before Fountain City, running north of Trempealeau and down to Onalaska. A 48-mile route that follows Highway 35 through Cochrane before routing east of the highway before Fountain City, then heading to Galesville before running to Onalaska. A 55-mile route that runs south of Waumandee to near Arcadia, then runs south until it veers east into Galesville before heading to Onalaska. All three routes would then hook into a substation that would be built in the town of Onalaska, the application states. The documents filed with the Public Service Commission of Wisconsin relate to the Wisconsin portion of a proposed 120- to 145-mile line that would stretch from Hampton, Minn., to La Crosse. Officials with CapX2020, an energy-company consortium, say the $450 million project will ensure the areas along the line have access to reliable, affordable electricity. But portions of the plans, which could possibly affect more than 1,000 landowners in the two states, have received opposition on both sides of the river. Two groups have filed several court motions in objection to proposed CapX2020 routes in Minnesota, but have been unsuccessful so far. And both the Mississippi River Parkway Commission and the Wisconsin Department of Transportation have submitted letters objecting to any new voltage lines along Hwy. 35, which is part of the Great River Road National Scenic Byway. A final route for the Wisconsin portion of the line will not be determined for at least a year, documents state. Under that timeline, right-of-way acquisition would start in July 2012, construction in 2013 and the lines would be put in service in December 2015, according to the application. CapX2020’s submission Wednesday of the Certificate of Public Convenience and Necessity application simply starts the process, company officials said. If the application is deemed complete, the public review process will begin, and an environmental review and impact statement will also be completed. A similar environmental impact statement for the Minnesota portion of the project is expected to be complete this month, officials have said.